Conclusions A multilocus model with a dominant gene for magic might exist, controlled epistatically by one or more loci, possibly recessive in nature. 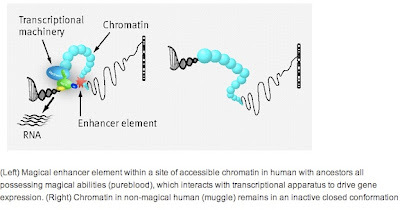 Magical enhancers regulating gene expression may be involved, combined with mutations at specific genes implicated in speech and hair colour such as FOXP2 and MCR1. Now, like all good modern journals, BMJ allows comments on their articles (called "rapid responses" to make them sound less Live Journally, I suppose). One of the commenters has an excellent suggestion: a follow-up article on the heritability of Jedi powers. A tough research project since it would require sitting through Episodes I-III and reading the massive array related literature, but someone should definitely do it!